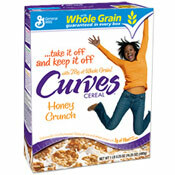 In 2007, General Mills teamed up with Curves to launch a line of weight management products under the Curves name. The partnership was said to have evolved as a competitive measure to counter Kellogg's success in marketing Special K cereal to women. As of 2008, Curves was the world's largest fitness franchise catering exclusively to women. In addition to the cereals - Whole Grain Crunch and Honey Crunch - two chewy granola bars were included in the initial line of Curves products. It's the "bee's knees" with crunchy toasted flakes, sweet honey and packed with fiber. A yummy way to get over 1/2 of your whole grains each day! A one-cup serving of the cereal had 190 calories, 1 gram of fat, 5 grams of dietary fiber, 9 grams of sugar and 4 grams of protein. The cereal has been said to taste similar to Special K, Total or Wheaties with lighter, crunchier flakes and a touch more sweetness. Both Honey Crunch Curves and its sister cereal Whole Grain Crunch Curves were promoted with the tag line "... take it off and keep it off." 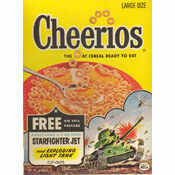 Both cereals also included a large image of a fit woman jumping for joy on the the front of the box. 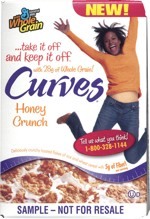 Initial boxes of the Honey Crunch variety featured an African-America woman while the Whole Grain Crunch variety made use of a Caucasian-American model. 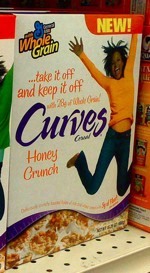 What do you think of Curves Honey Crunch?